Who doesn’t love deliciously gooey cheese, a warm and toasty crust, and heaps of toppings? A staple for many families, store-bought or home-delivered pizza can be high in fat and calories, which isn’t ideal for those looking to stick to their healthy eating resolutions. Fortunately, making your own pizza is a fun way to satisfy your cravings without derailing your dietary goals. From the crust to the toppings, here are a few healthy alternatives to pizza ways to make your next meal more nutritious. 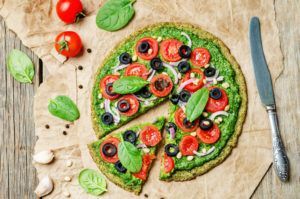 A significant portion of the calories in pizza come from the dough, but there are plenty of ways to switch it up. A Portobello mushroom cap makes a great base for a single-serving pizza. With its rich, meaty texture, you won’t even miss the bread. Eggplant slices are another alternative to a bread base, offering a low-cal and high-fiber option. If you absolutely can’t go without your crust, pita crust or whole wheat and gluten-free dough can be used to lighten up the caloric load. Many store-bought or pizzeria sauces are packed with added sugars, preservatives, and oils. By making your own sauce, you can control the ingredients and know exactly what you’re intaking. If you’re adventurous, forgo the sauce altogether! Tomato slices add a great tomato taste while avoiding artificial sugars. Hummus also makes a great alternative to traditional pizza sauce. The protein of chickpeas will fill you up, and it tastes delicious. You can also spread a thin layer of ricotta cheese for a light, white sauce. Many pizza lovers don’t realize just how much sodium and calories are hidden in the toppings. Turkey sausage and roasted chicken provide a healthy and satisfying alternative to regular pepperoni slices. Bell peppers, mushrooms, and black olives are common pizza toppings, all pleasantly nutritious. Some other nutrient-rich options include butternut squash, tofu, lox, and artichokes. Get creative when browsing the aisles during your next supermarket visit. You may discover a new favorite! With these healthy alternatives to pizza, sticking to your new year resolutions is easier and tastier than ever before! You can shop all of these substitutes at your local Foodtown grocery store. For great savings, be sure to check out our latest sales and specials. Shop online today (available at select locations) or visit the Foodtown grocery store located nearest you. Whichever way you shop, you can save big with ongoing promotions and savings via our weekly supermarket circular.